Nearly all of our vintage photographs are from the Middle East, especially from the Holy Land. But in honor of the Jewish festival of Purim, joyously commemorated this week by Jews around the world, we bring our readers a print we found in the Library of Congress archives. The Purim holiday commemorates the victory of Queen Esther and Mordechai over the evil Haman of Persia, saving the lives of the Jewish people. The picture appeared in an American newspaper on April 1, 1865. The wood engraving is captioned, "The Hebrew Purim Ball at the Academy of Music, March 14." The picture contains a large sign, "Merry Purim," another sign listing the "Order of Dancing," and merrymakers wearing costumes and masks. We found another engraving from Frank Leslie's newspaper, also of the Academy of Music, in the Library of Congress archives. 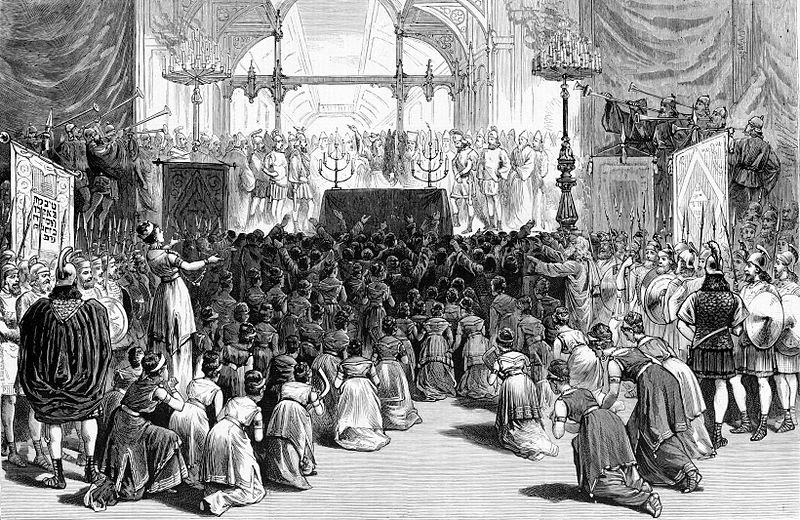 It is dated 1880 and captioned "New York City--the Chanucka celebration by the Young Men's Hebrew Association, at the Academy of Music, December 16th--scene of the sixth tableau, 'the dedication of the temple.'" This is how the New York Times described the event shown in the picture above. March 15,1865: The activities surrounding “the fourth annual masquerade ball of the Purim Association” which was held last night was described in an article published today entitled “The Purim Ball--Grand Masquerade at the Academy of Music.” According to the article “The Purim Ball is held to commemorate one of the great epochs of Jewish history -- the deliverance of the chosen people from the machinations of Haman, Prime Minister to King Ahasuerus, of Persia.”The Purim Association raised approximately $9,000 for its charitable activities through the sale of 900 tickets at $10 each. The society also published the Purim Gazette, a paper which is printed at each recurrence of the Purim ball.1867: The Amusements Column, in an item styled "Last of Shylock" reported that this evening marked the next to the last performance of “The Merchant of Venice” at the Winter Garden Theatre. There would be one more Saturday matinee and then "farewell to the Jew for the Season. The Merchant of Venice featuring Shylock reportedly was the first Shakespearean play to have been performed in United States; a performance that took place in colonial Virginia.